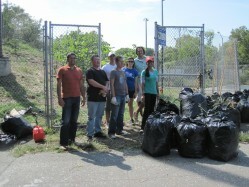 Williamsburg St Native Grasses: Thanks Rosetta! On Saturday, September 25th, a team of volunteers from Rosetta joined BGI to cultivate (ahem, weed) the native grass site adjacent to Williamsburg Street. It was a sunny day and the transformation was magnificent. The grasses are there, sparsely, but they have not yet bolted. We hold our faith in what we have been told: that it takes three years for the grasses to become fully established. In the first year they sleep, in the second they creep and in the third they leap…here’s hoping! Many thanks to the Rosetta team for all of their work! If your company would like to help us adopt one of the sites along the greenway, please call Brian McCormick at 718.522.0193.